Sticky Password manager and form filler securely stores your passwords, automatically fills in login account fields for programs and websites. This product contains also strong password generator. * Sticky Password manages all your passwords and personal data. * Automatically fills in forms for you. * Generates extra-strong new passwords, whenever you need them. 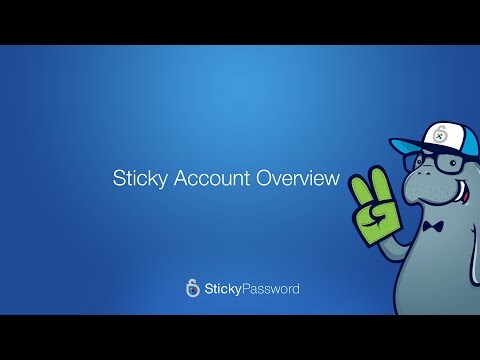 Sticky Password was added by Fred in Dec 2009 and the latest update was made in Aug 2018. The list of alternatives was updated Apr 2019 There is a history of all activites on Sticky Password in our Activity Log. It's possible to update the information on Sticky Password or report it as discontinued, duplicated or spam. Alternatives to Sticky Password for Windows, Mac, Android, iPhone, Linux and more. Filter by license to discover only free or Open Source alternatives. This list contains a total of 25+ apps similar to Sticky Password. I was truly disappointed it did not work out for me, I had earlier used Roboform but never liked it. and have downloaded a few others, but we didn't get along too well. I need a solution quite quickly, but it takes time to check things out properly, And that is something I don't have much of at the moment, not just because of my great age, the main reason being I decided to change my broadband supplier, which turned out to be one of the biggest mistakes I have ever made. I have been quite productive unfortunately in this area. To the point I am on the hunt for something that will accurately work across different devices, portable and desktop, has accurate synchronisation via local wifi, and the truly magnificent simplicty of SP. Of course, it doesn't exist, or does it? Any suggestions from users would be more than highly appreciated. PS Congratulations to the developers of this site, really good idea, getting better alternatives, will see later what comes up for Facebook - we are almost sworn enemies now, me and FB.